Many students completing their undergraduate, graduate or professional studies are required to complete an internship or externship for academic credit. Some students will choose to participate in an internship or externship in order to gain additional skills before entering the workforce. Regardless of the motivation, there are resources in place to help students prepare and receive assistance should they experience sexual misconduct onsite. Title IX Yes, universities that place students in required internship programs are covered by Title IX even when the initial alleged discrimination is by an internship that is not covered by Title IX. (Your College or University affords rights to you as a student as long as the internship is contributing to your education.) Yes, universities that place students in required internship programs are covered by Title IX even when the initial alleged discrimination is by an internship that is not covered by Title IX. What have I heard or read about where I am interning/externing? Is there public information about how interns have been treated? Are there current employees who previously interned at this site? Can they provide insight about the workplace environment? Is this an environment that values diversity? What are the non-discrimination and sexual harassment policies? Once a student is in their internship/externship it can be intimidating to reach out for help, or report an incident of harassment or discrimination. The following scenarios can help a student better identify harassment in the workplace. The onsite supervisor has suggested, in not so many words, that if the two of you develop a relationship outside of work benefits might come your way. This behavior is an abuse of power, and the student is never at fault should this occur. A student should never feel pressure to have anything outside of a professional relationship with their supervisor. Another employee often brushes up against you, finds reasons to be near you, and you catch them staring at you throughout the day. This is a form of sexual harassment. It might be difficult to confront that employee directly and tell them to stop. A student can report this behavior to their site supervisor, and their internship coordinator at their campus. Another employee makes lewd comments and jokes that are sexual in nature. It is often in your presence, and you are encouraged to play along. This behavior creates a hostile work environment. A student can report this behavior to their site supervisor, and their internship coordinator at their campus. A student might never experience any of these scenarios, but might witness it happening to someone else in the workplace. This too creates a hostile work environment. If a student witnesses this happening to another intern or coworker know that there are direct and indirect ways of intervening. A student can check in with the fellow intern or coworker, remind them this wasn’t their fault, and offer to support them if they report this behavior to a supervisor. 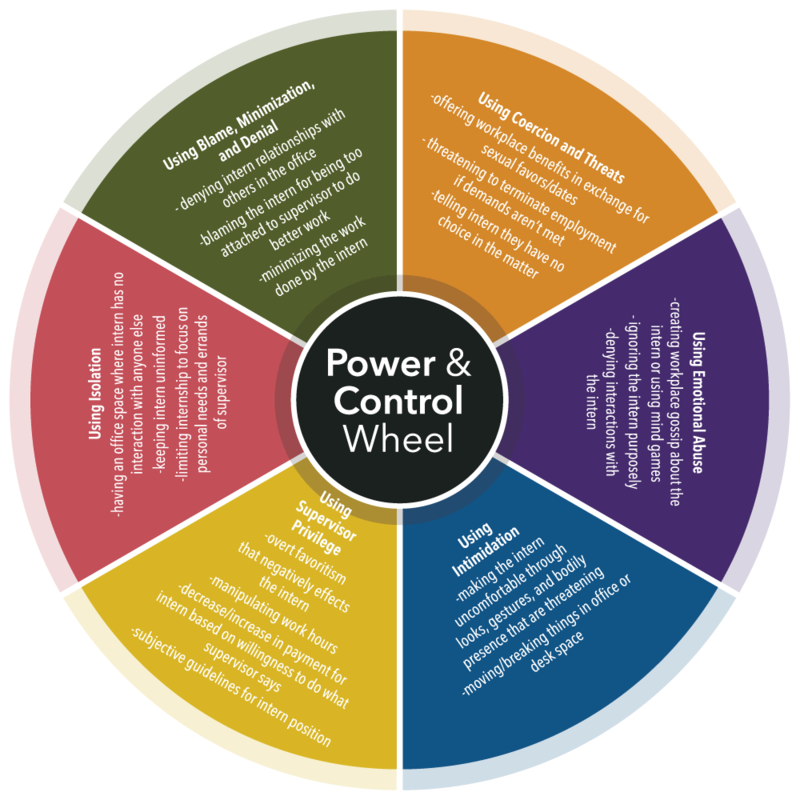 The power and control wheel provides additional examples of how students might experience harassment in the workplace. Above all it is important to remember that if this occurs it is never the fault of the student. It is an abuse of power.